Living with a severely disabled child can have profound effects on the entire family – parents, siblings, and extended family members. It is a unique shared experience for families and can affect all aspects of family functioning. On the positive side, it can broaden horizons, increase family members’ awareness of their inner strength, enhance family cohesion, and encourage connections to community groups. On the negative side, the time and financial costs, physical and emotional demands, logistical and legal complexities can have far-reaching effects. “Italians woke up today in a better country”, Prime Minister Matteo Renzi said following the Parliament vote on the new Italian disability law. “This law is an act of civility for thousands of families”, Renzi added, saying that he is proud of the legislators who approved the new laws. It has been many years in the making. Finally, however in mid-June 2016, the Italian Parliament approved a law aimed at supporting severely disabled people. The new legislation is known as ‘Dopo di Noi’ (After Us). It makes allowance for severely disabled people without parents, or family members, or whose parents can no longer take care of them, to receive government assistance. Provisions can be progressively applied while the parents or guardians of a disabled person are still alive. For example, individual treatment and care plan for a disabled child can be put in place, trust funds can be established and estate planning activities can be organised with more clarity. Article 1 of the new Italian disability law states that it: ‘aims at promoting the welfare, full social inclusion and autonomy of people with disabilities.’ This is important because for the first time, the Italian legal system identifies, recognises and creates a regulatory framework to address specific protections for people with disabilities when they no longer have their parents or relatives to look after them. The objective of the law is to ensure maximum autonomy and independence of people with disabilities, allowing them, for example, to continue living in their own homes or in facilities managed by associations. The Italian Senate’s text also extends protections to disabled individuals who, despite having parents who are still alive can, perhaps for health reasons, no longer have their support. 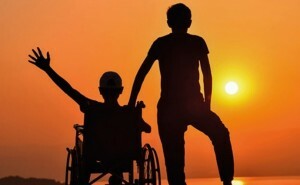 The new Italian disability law, Dopo di Noi, establishes a fund for the assistance and support of disabled people who have no help from their family. And, it creates benefits for individuals, organisations and associations providing care and guardianship of a disabled person. Tax relief, exemptions and incentives associated with insurance policies; trusts and transfers of assets and rights. Each year by 30 June, the Ministry of Labour And Social Policy has an obligation to submit a report to review the status of implementation of the law. The fund is to be shared by the regions, local authorities and non-profit organisations. There is a three-year allocation for the fund. €90 million for 2016, €56.1 million in 2017 and €38.3 million for 2018. A total of €270 million over the next three years. The requirements for access to funding will be identified by the Ministry of Labour within six months after the entry into force of the text. Regions will have to define the criteria for the disbursement of funds, verification of the implementation of the activities and the grounds for withdrawal of funding. The money in the fund will be for programs and innovative solutions for residential housing and to encourage independence, such as co-housing, or apartment groups that reproduce familiar living conditions and foster social skills. The fund will also support projects to develop autonomy for people with disabilities. This new Italian disability legislation also specifies tax benefits. To take advantage of these, they will need to be stipulated in tax returns. Exemptions and reductions on: transfers of property after death of family members, establishing trusts and other legal protection. Deductions on expenditure for disability insurance policies covering the severely disabled. Parents or guardians with a severely disabled child often insure themselves to provide for their child when they have died. From December 31, 2016 these life insurance premiums will increase from €530 to €750. Article 5 of Dopo di Noi provides for a €220 insurance premium deduction on annual tax returns. Any transfer of movable or immovable assets due to death, through a donation, a trust fund or a gift, will be exempted from inheritance tax. However, it will need to be proven that the purpose of each transfer has been made to benefit ‘social inclusion, care and support of persons with disabilities’. This objective must be explicitly stated. For trusts, the law provides for the same deductions recognised by other types of legal relationships. When establishing a trust, in addition to stating the purpose of the trust, it must also be specified who manages the trust and the duration of that relationship, which will be the date of death of the disabled person. Transfers of assets and rights across a trust for persons with a severe disability established as laid down by the law remain unchanged. These are expenses arising from stamp duty, mortgage and land. While they are exempt from payment of stamp duty, donations and gifts made by individuals can be deductible up to a maximum of 20% of taxable income and €100,000 a year.